Over a decade after the release of Don’t Wake Me Up (1999, K Records), Mount Eerie’s Phil Elverum is touted to be one of modern folk-rock’s most notable personages, ranking cornerstone-status with critics and contemporaries. Since performing under the former moniker The Microphones, Mount Eerie has arrested listeners with stunning creative outputs; works oftentimes heavily-influenced by the Pacific Northwest environs from which he hails. Mostly artistically-hermetic to Anacortes, Washington, Elverum’s surroundings have an immense imaginative grip over his music/production/photography/ publishing– an inspiration so obviously manifest in the very source of his namesake being derived from an actual mountain that looms over the forest where he grew up. Mount Eerie’s artistry is incredibly rich in understated minimalism, subtle esoteric tones, and triumphantly-crowned with organic achievement. These signature artistic markers are tightly woven into the fabric of Mount Eerie’s sonar landscape as much as they are inherent in his surrounding physical environment. Elverum’s music is striking as platform and medium to the junction of spatial naturalism and subliminal, romantic curiosity, always brilliantly highlighted with the most potent and unparalleled verbose/aesthetic detail. 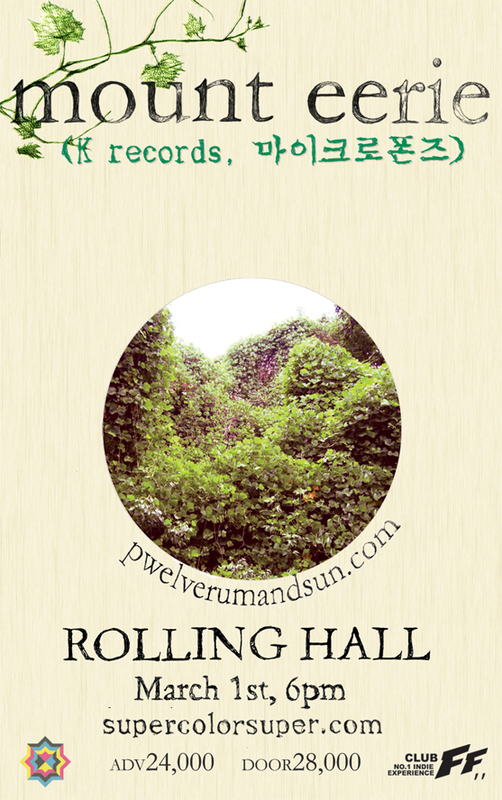 앨범 [Don’t Wake Up](1999, K Records) 릴리즈 이후 어느덧 10년, 원맨 프로젝트 Mount Eerie의 Phil Elverum은 평단과 열혈 리스너들로부터 모던 포크 록 신의 가장 주목할 만한 천재적인 인물이라는 평가를 받아 왔다. 1990년대, 로파이를 기반으로 일렉트로닉 팝을 가장한 초 아날로그적 프로젝트였던 The Microphones 시절부터 Mount Eerie는 가히 충격적인 크리에이티브한 작업들로 리스너들을 사로잡아 왔다. 그 내면에는 그가 종종 묘사하는 태평양 북서부의 광활한 자연 환경으로부터 영향받은 독특한 음의 세계가 자리잡고 있다. 예술의 정기가 가득한 Washington의 Anacortes라는, Elverum이 머금어 온 환경에서 기인된 독특한 창의성은 그의 무한한 상상력과 감각에 필터링되어 음악 뿐만이 아닌 프로덕션, 사진, 출판에 이르기까지 명백히 드러난다. Mount Eerie라는 이름 역시 그가 성장해 온 아름다운 숲 너머로 아스라이 보이는 실제 산의 이름이다. 무엇보다 그의 예술적 기교는 절제된 미니멀리즘과 매니악하면서도 절묘한 사운드의 색감을 통해 믿을 수 없을 정도로 풍부하게 표현된다. 이와 같은 예술적인 특징을 갖는 Mount Eerie만의 상징들은 그를 둘러싸온 자연의 풍경만큼 단단히 짜여져 있어, 그의 음악 역시 공간을 강조하는 자연주의와 잠재 의식, 낭만적인 호기심의 합류점을 이루는 플랫폼의 역할로 부각되었다. 여기에는 더할 나위 없이 강력한, 장대하면서도 심미적인 디테일이 부수적으로 따라 온다. On its original debut seven years ago, online music authority Pitchfork ranked The Glow Pt. 2 (2001, K Records) with a number one spot on their ‘Top Twenty Albums of 2001’ listing. The recent reissue of the album with bonus disc, has proven that Elverum’s most essential work continues to appeal– remaining intact as a culmination of exceptional production and impressive songwriting that stands immune to the test of time. Intense exploration of personal themes, recalling lost loves and childhood memories, are seamlessly captured in a composition so versatile that gentle melodies over muted acoustics seamlessly interchange with more textured layers of indulgent, explosive guitar noise and booming drums. The album continues to make avid listeners of those fortunate in stumbling across its second birth. When home in Anacortes, Elverum operates P.W. Elverum & Sun, ltd., a “family-run poem printer/record label/souvenir vendor” and creative portal for releasing the products of his refined crafts. 7년 전 공식 데뷔 앨범 [The Glow Pt.2] (2001, K Records)는 피치포크의 «2001년 탑 20 앨범»의 넘버 원을 기록한 바 있다. 2008년, 보너스 디스크가 추가된 리이슈 앨범은 Elverum의 가장 기본적인 루츠가, 눈에 띄는 프로덕션과 인상 깊은 송라이팅의 정점으로 고스란히 두드러지며 시간이나 유행에 구애받지 않음을 증명해 주었다. 실로 Elverum의 음악은 뮤트된 어쿠스틱 사운드를 부유하는 부드러운 멜로디들로 가득 차 있는데, 이는 개인적인 테마들의 강렬한 탐험인 잃어버린 사랑과 유년 시절의 기억들을 상기시킨다. 격정적인 기타 노이즈와 아름답게 울리는 드럼 또한 이 멜로디들을 탄탄히 받쳐 주며 천상의 소리를 이끌어 낸다. 고향 Anacortes에서 Elverum은 ‘P.W. Elverum & Sun, ltd.’,라는, 가족과 함께 운영하는 핸드 메이드 북 작업소/레코드 레이블/기념품 가판대를 운영하며 그의 고상한 ‘작품’들을 소개하고 있기도 하다.